Texas summers can be exceptionally hot, and this past weekend was no exception. With temperatures hovering around 108 degrees and not dropping below 100 until 8:30 at night, I think it is safe to say it was pretty hot. That didn’t stop a great day on the Brazos River though. I haven't had the opportunity to go fishing in quite some time. I knew that the temperatures in Texas would be over 100 degrees, but I couldn't resist an opportunity to get out on the water. 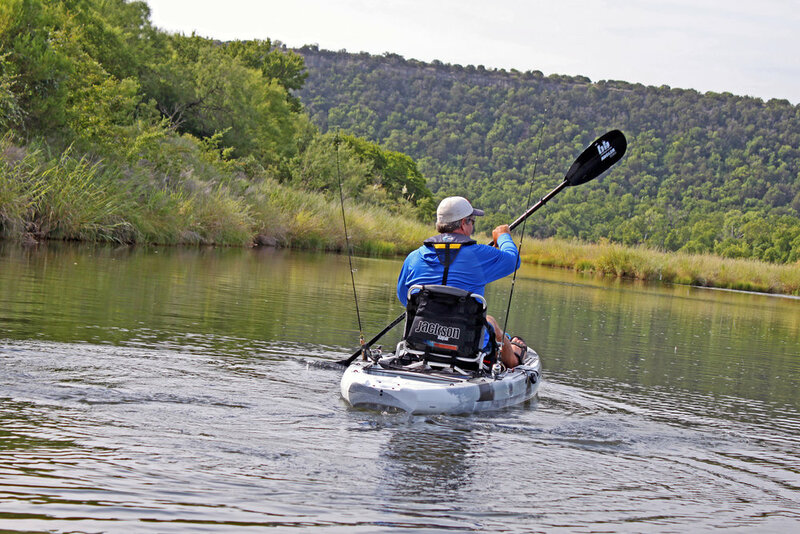 I decided to go to the Brazos River below Possum Kingdom Lake. I have had exceptional success on the Brazos River, including a 12 pound Largemouth Bass I caught a few years ago. 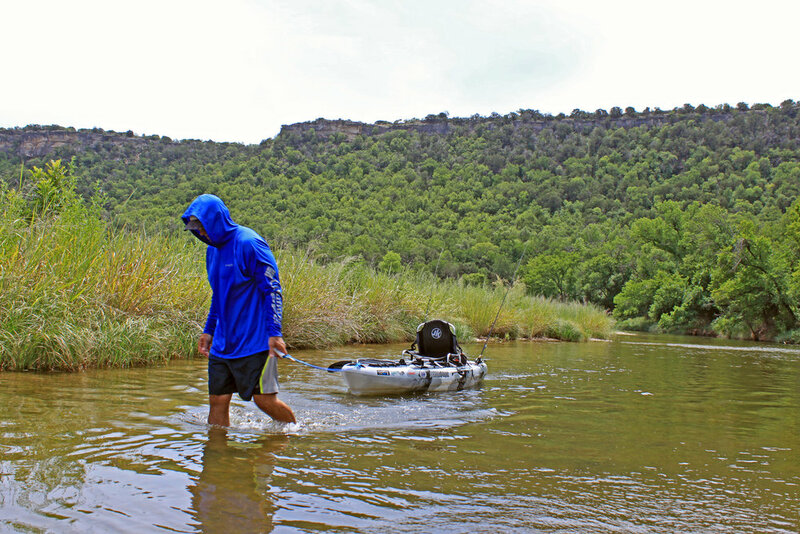 On this trip to the Brazos, I didn't expect any monsters, in fact I didn't expect to catch much due to the conditions. I took my Pau Hana Endurance and my dad came with me on a Jackson Kayak Liska. 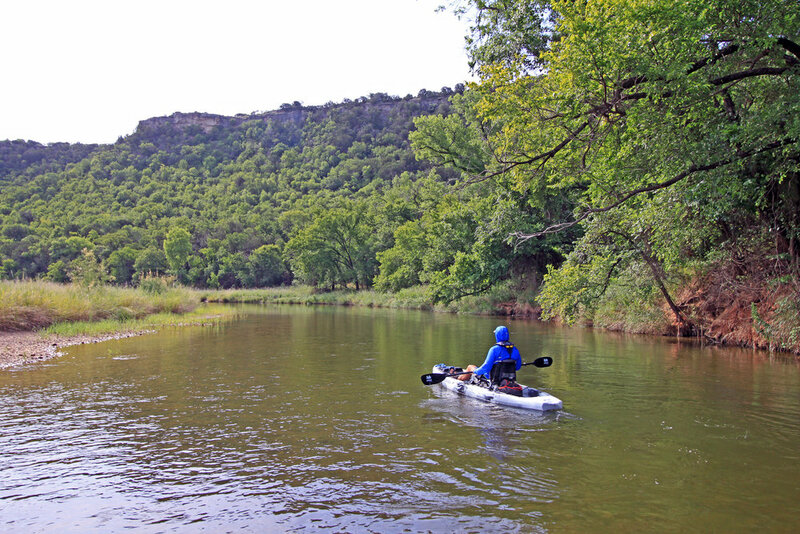 We started off somewhat early in the morning with about 160 CFS flow on the Brazos. I started off fishing with a Strike King square bill crankbait and quickly caught a fish that I did not expect to land - a catfish. I never fish for catfish, but once every couple of years I do land a catfish. It was not what I wanted, but it definitely added some diversity to my day. My dad was the first one to catch a bass, it wasn't huge, but it was a fun catch nonetheless. A little later I caught another fish on my crankbait, but it wasn't a largemouth bass - it was a white bass. I couldn't believe that I caught a catfish and white bass without even trying. Once again, I was pretty amazed with this so I had a lot of fun... but I wanted to land a largemouth bass. It took me a little bit of searching with my crank bait from my Pau Hana Endurance, but I soon landed a nice little bass. It was a blast catching this rascal, but it wasn't a monster. I was really surprised that me and my dad we actually catching fish on such a hot day for bass fishing. I didn't think I would actually land a big bass, but I kept on searching for a larger bass in hope that I would land one. My dad would land the next bass, which was around the same size as his previous one. He was using a light action spinning setup with a Worden's Rooster Tail in Fire Tiger. 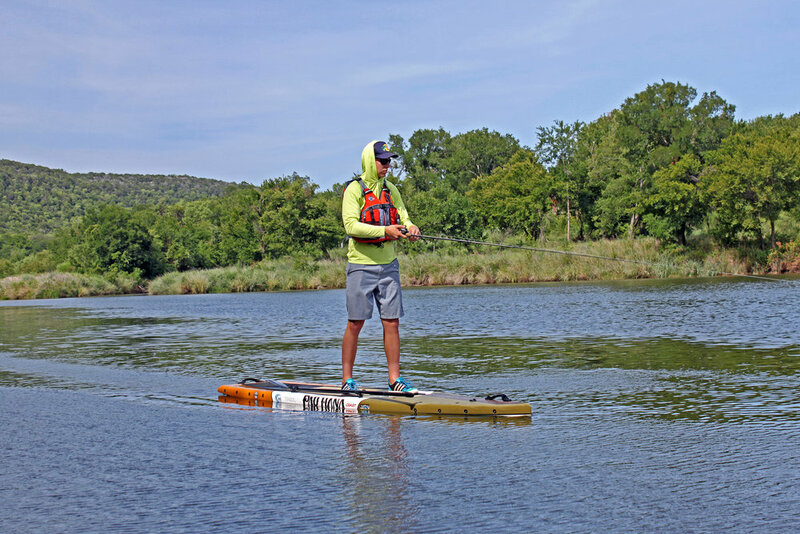 Although I didn't fish or paddle from the Liska, my dad says the Liska is extremely stable and is a great platform to fish from . The maneuverability is great; however, straight line speed is average. Something my dad really liked about the Liska is how stable and simple it was. The Liska was doing some work but I had to get my Pau Hana Endurance on some fish. I soon did. I casted my crank bait towards some submerged rocks. While I was reeling in my lure I couldn't help but look at the amazing scenery around me - including cliffs over 400 feet tall. I was really in awe looking at the neat scenery, but then I was in awe when I hooked a nice largemouth bass. This guy fought unbelievable hard. I caught a glimpse of the bass as it darted past my Pau Hana Endurance trying to get away. I had a good treble hook set in his jaw though, so he wasn't going anywhere. 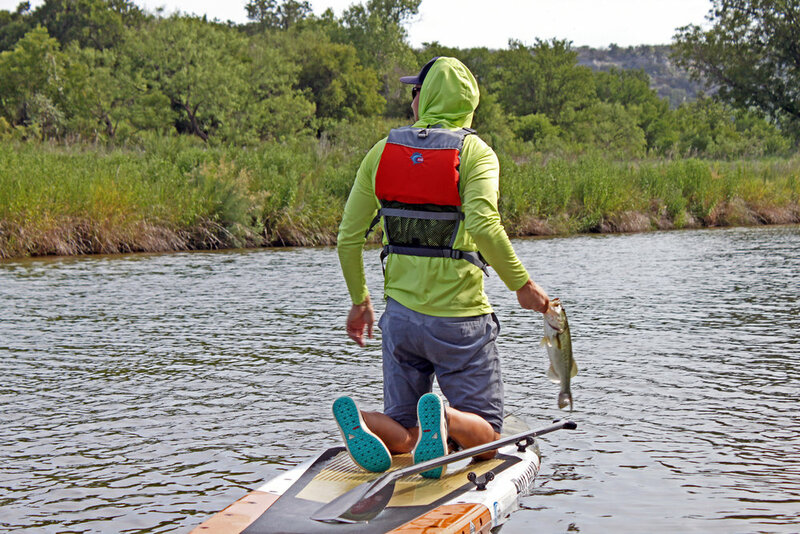 I got the bass to my paddleboard and I was so happy to catch a good 2.5 pound bass on the Brazos River. This is by no means a monster, but it definitely was a blast to catch and I couldn't ask for more. This fish was so healthy it was almost unreal. There was plenty of fight left in him too as he gave me a good splash as I released him into the water. What a nice way to spend a Saturday morning - catching some bass on the Brazos River. As the mid morning progressed into early afternoon I could really feel the heat hitting. There wasn't much action after my last bass I caught so I quickly changed tactics and starting to catch something else - catch some pictures of snakes. As I was paddling back to call it a day I saw a log that was semi-submerged in the water. 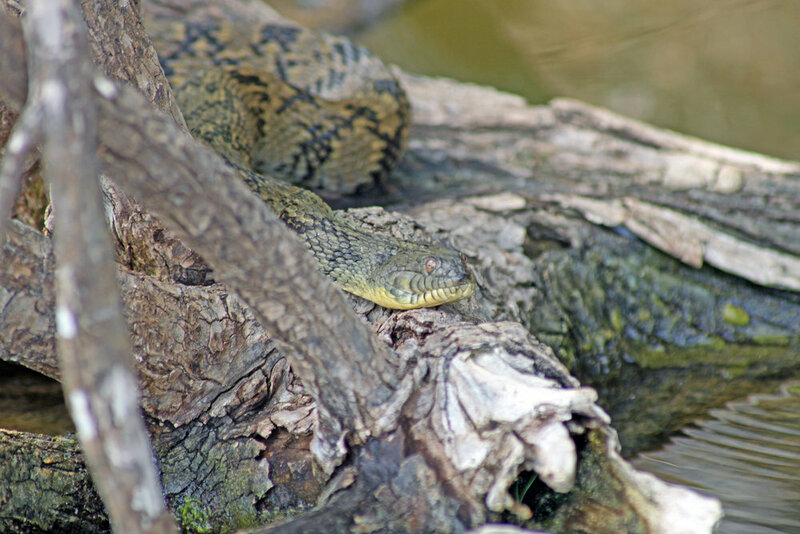 I saw something a little unusual and as I got closer, I realized it was because there was a big snake catching some sun! This guy was a big snake. I quickly pulled out my Canon DSLR and got some photos. This might have been the most exciting catch of the day. It is always a blast getting out on the water and catching some fish just adds to the fun - catching some photos of a big snake makes it even better. 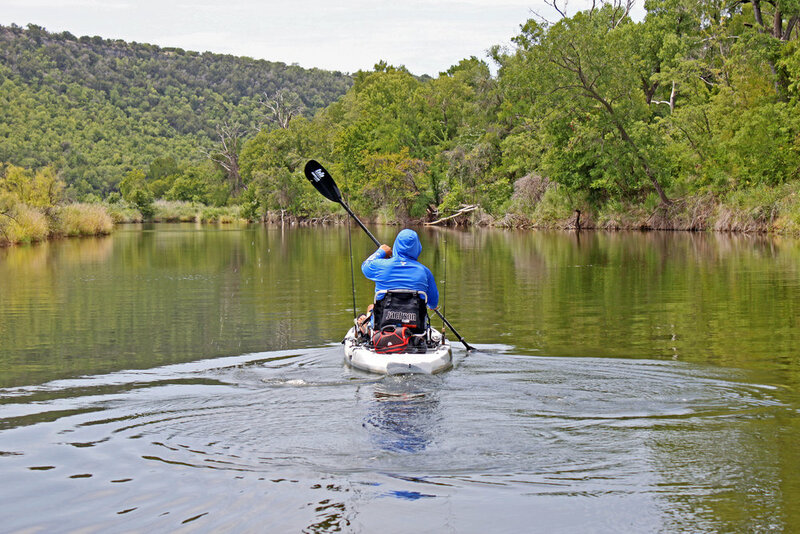 If you get the time, try to give the Brazos River a shot, it is a great place to go. Just make sure to have proper protection from the Texas sun.